Digital sequencer with 8 parts, 16 sub-sequencers for modulation, chance operations and presets. 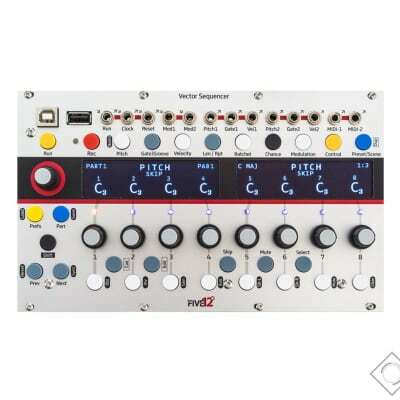 The Five12 Vector Sequencer is a digital sequencer in the Eurorack modular format. It provides a flexible sequencing engine with support for 8 independent parts, 2 sub-sequencers per part for internal modulation, an extensive set of chance-based operations, and presets with a playlist function. Built-in outputs on the unit support a variety of CV and MIDI connections: Two sets of analog outputs with Pitch, Gate and Velocity signals, two MIDI outputs on 3.5mm TRS jacks, and both USB A and B connectors for MIDI over USB. There are also three bi-directional trigger I/O connections for sync, clock and trigger functions, and two CV inputs for external modulation. An optional Jack Expander module adds support for 4 more analog voices (Pitch, Gate, Velocity), 8 more trigger outputs, MIDI in and out on DIN jacks, and dedicated jacks for DIN Sync (in and out). All outputs are freely assignable to any of the the internal parts. The UI for the Vector is based around two sharp and contrasty OLED display panels, with a resolution of 256 x 64 pixels. Just below the displays are 8 encoders used for editing parameters. Along the top of the displays are buttons for switching between edit pages for Sequence Recording, Pitch, Gate Time, Velocity, Step Length, Ratchet, Chance Operations, Modulation, Sequence Controls and Presets. To the left of the displays is a ninth encoder. This can be used to edit all, or a subset, of the steps of a sequence at a time. For instance, you can quickly select all the odd-numbered steps and edit the gate time for them all at once. Below the main 8 encoders is a group of buttons that form a one octave keyboard. In most of the primary edit modes (Pitch, Gate, etc), the white buttons are used for one of three sub-modes: Skip, Mute or Select. When Recording, these buttons can be used for entering, transposing or modifying sequences. On the bottom-left of the panel are next and previous buttons for transposing the keyboard up or down, or for paging through sequences longer than 8 steps. The Shift button can be used with most of the edit mode buttons (Pitch, Gate, Velocity, Step Length, Ratchet, Chance, Modulation, Skip, Mute, and Select) to reset that particular parameter back to it's beginning state. Shift plus any of the white buttons triggers other modifying operations on the sequence, including clearing out the entire sequence. A dedicated Part page shows activity for all Parts at once, with modes for mute and solo. Each part has access to up to 20 presets, and there is a preset playlist function. There is also a Scene page for managing presets across all parts at once. Per-step chance operations allow you to add a variety of generative behaviors to each sequence. For each step you can set the chance operation, the probability that it will occur, and which musical bars it will occur on. That last option is particularly handy for creating fill patterns. 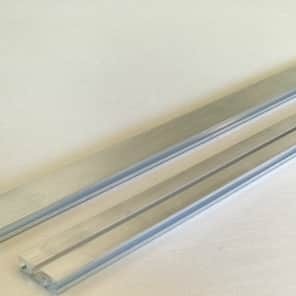 Chance operations include: Mute, Un-mute, Skip, Un-skip, Select, Un-select, Jump Forward, Jump Backward, Jump Any Direction, Accent Low, Accent Medium, Accent High, Gate Shorter, Gate Longer, Gate Tie, Ratchet X 2, Ratchet X 3, Ratchet X 4, Repeat X 2, Repeat X 3, Repeat X 4, Randomize Pitch (+/- 12 semitones), Randomize Pitch Up, Randomize Pitch Down, Randomize pitch to any semitone +/- and octave, and Random Jump to any of 16 steps. There is a micro-SD card installed on the back of the unit for saving projects, including default options for background auto-saving of projects, and auto-loading the most recent project on startup. You can mount this SD card onto your computer for offline backup (and firmware updates) via the USB A jack.